Sell Your Items with JBF! We have videos, tutorials, and a great facebook group to help you along! 3. Create your tags using our online tagging system. Bring your items to drop off at the time shown below. Sell with us and make 60% back on your sales, less a $12.50 consignor fee per sales event. Be a Team Member at the sale for 4 hours or more and earn 70%. The $12.50 consignor fee is waived for consignors who help for 8 or more hours. Consignors at JBF Wilkes-Barre/Scranton earn an average of $300 at each sale! Team Members are the heart of JBF and what make our sale so special. You get to help local parents/caregivers be their own family's budget hero! You will sign up for your drop off time when you complete our online Consignor Waiver. Please complete this BEFORE drop off. Thanks! 1. Bring your items tagged, prepped, and sorted by type (ex: toys, feeding, bedding, etc. ), gender & size. 2. Bring your signed Car Seat Waiver (link below), if selling a car seat. 3. When you arrive, bring one item to the check in desk for us to scan you into the system. A friendly JBF Team Member will be there to greet you. You will then place all items where they belong on the sales floor, so please plan to allow 30-90 minutes for this process. Find more items to consign? You can bring them to this mid-sale drop off! We accept all items at this drop off EXCEPT clothing and shoes. All items will be sorted by Consignor number, so please bring that number with you. There will be JBF Team Members there to assist you in finding your items. All items that have not been picked up by 9:01p on Sun October 20 are donated to our charity partners. We cannot hold leftover items for you. No exceptions. We accept fall & winter children's clothing for this sale: Boys Newborn through size 10, Girls Newborn through size 10, as well as all season maternity sizes. Be picky! Look at your clothing items as if you were going to purchase them. Any items that look like "mom's" clothes will be rejected at inspection. No stained or damaged items will be accepted. No items with any type of smell: smoke, cooking odors, body odors, etc. Please freshly clean your clothing items. Replace missing buttons, sew loose hems and seams, and clip loose threads. Please button all buttons, snap all snaps, zip all zippers before you arrive at drop off. This will ensure that there are no defects in the clothing. The newer the item looks (and the better it smells), the better it will sell. Packaging & Hanging: Please hang clothes so the hanger hook points to the left (like a “?” question mark). Hang size 0-6 clothing on child-size hangers and sizes 7-10 and maternity clothing on adult-size hangers. Clothing that falls off the hanger onto the floor does not sell well. Old Navy and many outlet stores are great places to get free hangers (they throw away hangers daily!) and WalMart, Target, and Dollar General sell child-size plastic tube hangers at a great price. Clothing Sets - Sets tend to sell better (under size 6) so match things up if you can. All garments should be hung with the hanger hook pointing left (hanger should resemble a question mark when looking at the front of item). Safety pin or use a tagging gun to attach clothing sets securely with bottom garment hung on the backside of the shirt, so both pieces can be viewed without separating them. Pants/Shorts - Pants hangers are great, but if you use a standard hanger, simply use your tagging gun to attach pants to the top part of the hanger so the garment will not slide. Onesies, socks, tights, hats and infant mittens need to be in a clear zip-lock bag (you may group multiple items in one bag). Please be sure to label your tag well so that customers know if the items are short-sleeve onesies or long-sleeve onesies. Pricing: Hanging Clothing - Put outfits/set together; they sell best. Start at $3 for basic, generic brand 0-24mo outfit. Add $1 each for larger size, name brand, formal, and heavy/winter. We DO NOT have a $3 minimum, this is just suggested pricing. Non-hanging Clothing - Put multiple items together to price for at least $3.00, but okay to price for less (i.e., 6 pair of socks for $1.50). Tagging: Clothing on Hangers - Attach tag with a tagging gun or safety pin to the label of shirt or upper right front of pants. Insert the tagging gun in a label or inside seam NOT through part of the clothing (to avoid making a hole or tear in the clothing). Also, pull on the tag to make sure it is properly secured and will not come off easily. Please make sure consignor tags are pulled out of the clothing so they are easily visible to the customers. Non-Hanging Clothing - Please use tagging gun or safety pins to attach tags to onesies, socks, tights, infant mittens, and accessories. Be sure to also attach multiple pieces together. Then put these items into clear zip-lock bags. Please do not tape bags closed - shoppers want to feel and inspect items before purchasing. Check out JBF's Clohting tagging video! These items ALWAYS sell well at JBF! Please check them all for recalls before bringing to drop off! Check out JBF's Large Item tagging video! Diaper bags, infant carriers, and backpacks are great consignment items. Please inspect all items carefully to make sure items have not been recalled (link below), stained, damaged or are missing pieces. We no longer accept breast pumps; however, pump accessories are okay to sell. Packaging: Please zip-tie items to an adult-size hanger so they can be displayed on the racks. Pricing: Price 50% - 75% off retail. Items in great condition tend to sell very well. 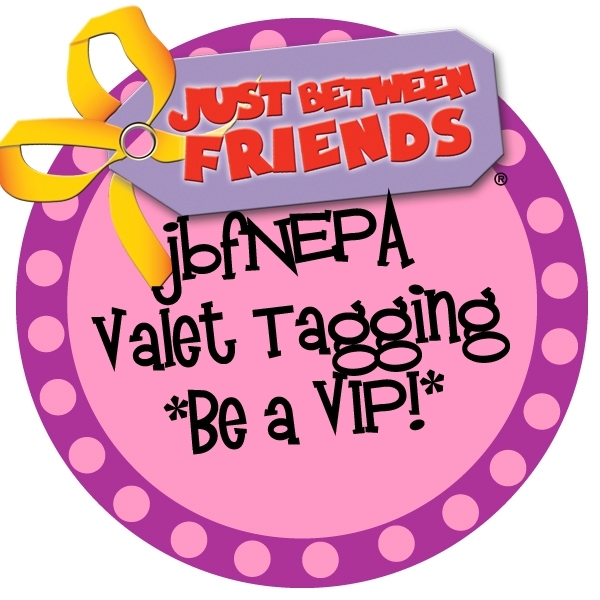 Tagging: Hole-punch your JBF tag and attach it to item with ribbon, string, or a zip-tie. If item contains multiple pieces, be sure all pieces are included and list number of items on JBF tag description. Packaging: Keeping tags and multiple items attached is essential for your items to sell. Bag all small parts belonging to toys/equipment in self-seal bags and tape the bag shut with clear packing tape. Fasten the bag securely to the item with ribbon, tape, or zip ties. Items must include ALL working parts. Pricing: Price 50% - 90% off retail. Tagging: Attach JBF tag directly to the item with clear packaging tape or hole-punch JBF tag and tie it to item. Check out JBF's Toy tagging video! Make sure that shoes are clean, clean, clean! We will be VERY selective with shoes during Consignor Drop Off & Inspection. Shoes must be current season (Fall = October thru March; Spring = April thru October). Packaging: Fasten shoes together with zip ties. For infant shoes or small shoes without laces, you may put the shoes in a clear zip-lock bag. We prefer no shoe boxes. However, if shoes are in the box, please remove the lid, secure it to the bottom of the box, and secure the shoes to the box (closed boxes do not sell well). Pricing: Shoes must be in good condition and should start at $3.00 for infant/toddler; Add $1 each for larger size, name brand, or boots. Tagging: Punch a hole in the top of your tag and attach the tag to the shoes with the ribbon, string, or zip tie. For infant shoes in a clear zip-lock bag, put the tag inside the bag, or tape to the outside of the bag. Check out JBF's Shoe tagging video! Bedding sizes accepted are bassinet through twin only. Padded crib bumpers are not accepted (mesh bumpers are accepted). Please be selective when selling bedding, blankets, receiving blankets, burp cloths, and towels. New and barely used items sell best. Check carefully for stains; shoppers get very disappointed if they find a stain in a bundled blanket once they get home. Check out JBF's Bedding tagging video! Books, book sets, board games, puzzles, video games, video game systems, scrapbook, arts & crafts sets are great items for resale. Please only bring kids’, parenting, homeschooling, pregnancy and child rearing books. Games and puzzles must have all pieces. (No "adult" content please.) Check items to ensure they are in great condition. Check for scratches on video games, and be sure all games are in their respective cases. Packaging: Use clear, self-seal bags or clear cling wrap (saran wrap) to hold multiple items together; Tie sets of books together with ribbon/string. Be sure that parts/games to video game systems (such as Vtech) cannot be separated or switched out at the sale. Pricing: Prices can range from $.50 to $50 in this category, depending on the item. Price to sell especially for books & DVDs as there are always lots to choose from at the sale. When tagging books, please attach your tag to the book with blue painters tape that can be removed without damaging the item. Tape tag to the outside cover of glossy books and to the inside cover of books that will easily tear when removing the tag. Please do not use masking, double sided, or clear packing tape. Hole-punch JBF tag and tie to sets. Check out JBF's Books, Games & DVDs tagging video! Exersaucers, cribs, swings, high chairs, changing tables, strollers, bath seats, baby walkers, car seats & car seat accessories must be checked for safety recalls (link below), must have all parts, and be in good condition. Children's furniture - cribs, beds (toddler, twin), desks, side tables, dressers, etc. must also be checked for recalls. Note: We DO NOT accept padded crib bumpers. Packaging: If item has multiple pieces, use packaging tape, zip-ties, or string to keep items attached together. If wooden furniture has loose parts, use clear plastic wrap to secure item. All furniture and equipment must be assembled during the sale. Batteries must be included, if applicable. Please bring a Car Seat Checklist/Waiver (link above) for all car seats, booster seats, and car seat base or infant carrier. Taggong: Attach your JBF tag directly to item with clear packaging tape or hole-punch JBF tag and tie it to item. Nursing covers & pillows, feeding items, monitors, safety items, diapering & toileting items, rattles, and more. Please check for safety recalls (link below) on all items that you consign. Packaging: If item has multiple pieces, use packaging tape, tagging gun, safety pins or clear self-seal bags to keep items attached together and clearly visible to shoppers. Batteries must be included, if applicable. Tagging: Attach JBF tag directly to item or clear self-seal bag with clear packaging tape or hole-punch JBF tag and tie it to item. Check out JBF's Multiple Pieces tagging video for some ideas on how to tag your items. Household items that other families will use (no knick knacks please). You may consign storage solutions (baskets, bin, shelving), furniture (no upholstered items), and décor (lamps, wall hangings, no antiques). Please Note: For this category this is No Donation Option: unsold Mommy Mart items must be picked up by the Consignor after the sale. We are not able to donate these items after the sale. Packaging: If selling multiple pieces together, be sure that all pieces are secured together. Pricing: Price to sell! These items are not the primary reason shoppers come to JBF, so price low! Tagging: Secure the tag to the item to ensure that the tag does not fall off during the sale and so that item is not damaged when the tag is removed after purchase. Want to sell your items but don't have the time to tag them yourself? Try our Valet Tagging service and let us do it for you! For this sale, we are accepting Fall/WInter clothing & shoes, as well as anything else "kid" that you may have around your house that your children no longer use. All items must be clean, free of smells, tears, rips, pilling, and must be current fashion. Consignors who use this service pay a $25 fee, and receive 45% of their sales. You will also receive a pass to shop early during our presale! Please contact Nicole.Pietrzykoski@gmail.com to request a spot. They are limited and filling quickly.